Well what a busy few days I had with Matt being away. I ordered a truck of soil as I had a few things I wanted to do. We still needed to fill the areas where we had moved the tanks. 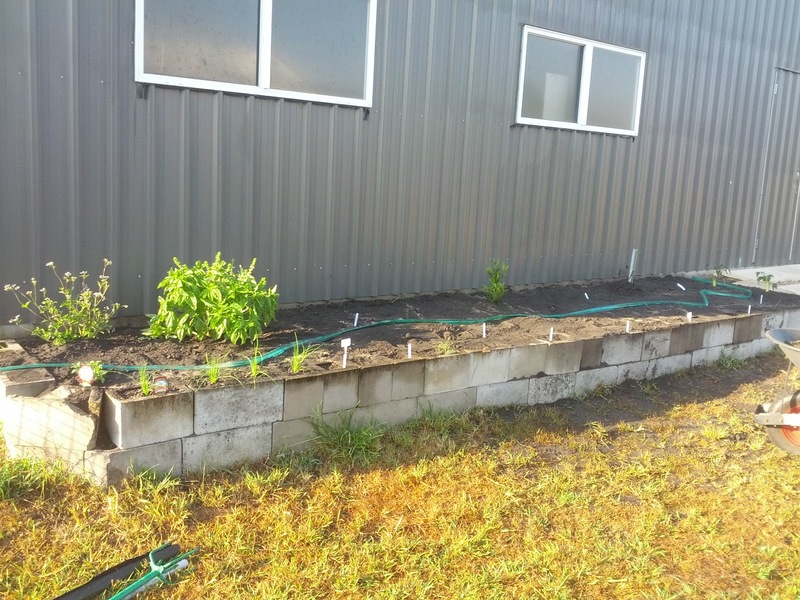 I removed the Yukka tree trunks and weeded the garden bed beside the shed (that we had ear marked as a herb patch) and I wanted to build a few new garden boxes and fill a few large pots. So the truck I had booked for Thursday morning, eventually arrived 3:30pm. I had already pulled up and weed matted the shed half of the path last weekend. I then pulled up the mid section to allow for the truck to deliver the soil between the house and shed. This also meant taking down the dividing fence and temporarily disconnecting the electric fence. 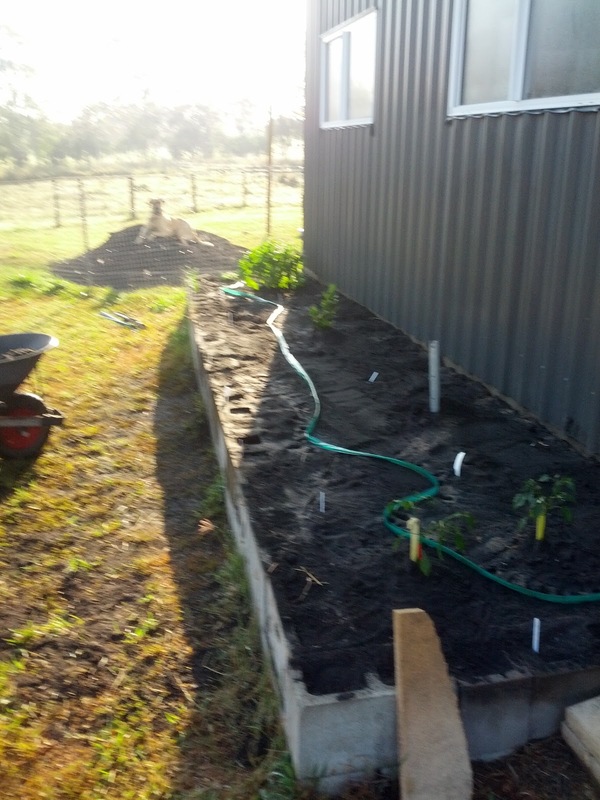 I wanted most left in the rear garden and the rest in/ near the herb patch, so that I could replace the fence and reconnect the electric fencing, before I begun barrowing. Having it nearer the tanks, also reduced the distance I needed to move it. Made sense… This did not do quite to plan. At the nearest point, there is approx 4.5- 5mters between the house and shed. The truck driver took many manoeuvres to reach this point; damaging many of the remaining pavers in the process. To be honest I didn’t think they were anywhere near her travel path. By the end I was just grateful that she didn’t hit the house! I did attempt to match the pavers however Bunnings offered some in that size (450mm x 450mm) in white, ours are cream at $18 odd each. So as she obliterated 14/15 and there were 2 previously cracked I decided to space out the existing and fill the remaining with stone chips, instead. So built the ‘wet patch’ up with earth, then laid weed matting (as for some reason this wasn’t done when the original path was laid). 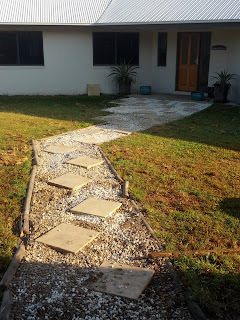 Then lay pavers and stone chipped. 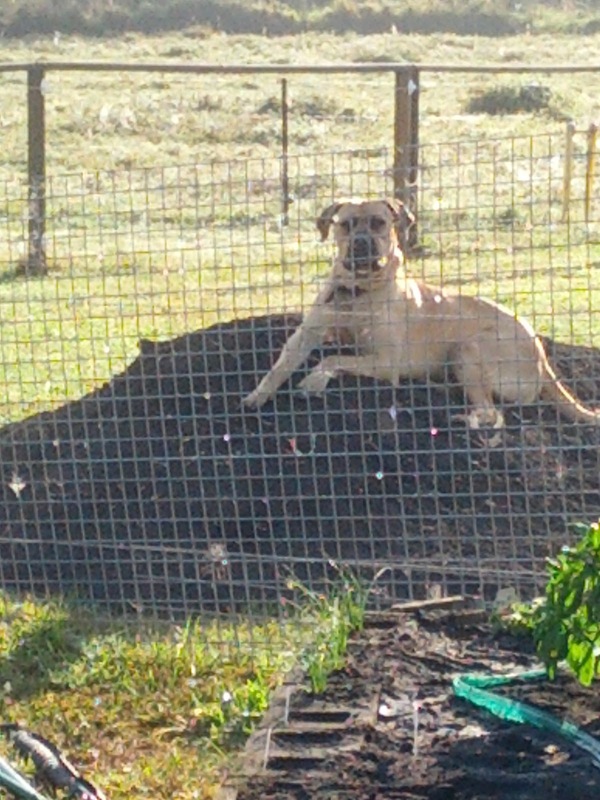 I did manage to get her to dump the majority of the soil for the front in the herb patch. The rest was for barrowing and filling random wholes that we had yet to do. From the previous owners dogs and other low patches, here and there. The majority was for my veg patch. Yesterday we moved the remaining soil from the front into my two new doorstep pots (though I haven’t got any plants to put in them yet). And barrowed the rest to my veg patch. We then levelled and planted out (and sowed) our herbs. I was surprised by the stock of seeds I had accumulated, ready for our herb patch. We transplanted an exisiting Basil and Mint plant (from my veg patch, a second reamins there as a back up). We rehomed the Bay tree, central to the patch, so it should have ample room to grow . As well as planting out a few chives and oregano recently purchased- I have had no luck raising Oregano from seed? We also planted out the two chillie plants we had had in pots on the patio table along side and a ginger plant. And then the seeds; Tarrogan, Lemon Balm, Cumin, Corriander, Parlsey, Dill, a few varying types of Basil and a scatter of lavender along side the shed door. 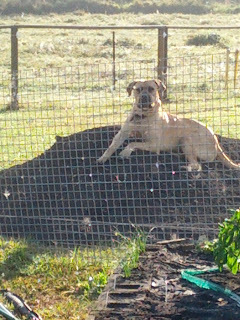 The mound out the back had shrunk. Some of this will fill my pallet veg boxes. Once I have them solid and secure. The remainder will fill around the tanks, as this is going to compact and need topping up. Til then it makes a great observation point from which Madog can watch the world go by. In other farming news, Matt agrees our ‘Christmas ham’ (a Berkshire cross Saddleback pig we picked up at the beginning of the year, for the freezer whilst we waited for our own piglets and pork supply) is looking a little podgy. Given I witnessed Smokey (our resident Berkshire bore) mount her just over a month ago. This could mean she’s expecting… This would be both exciting and problematic. Exciting in, especially if my dates are correct; she would be due a few days after my family arrive to visit. And in that after much waiting we would have piglets here. Problematic, however in that our lack of piglets to date could be put down to Smokey (our resident Berkshire gilt) and that Smokey is evidently 'working'. And we wil not being having our ‘Christmas ham’ for Christmas dinner wiith my family, as planned . So I guess this leaves us with what to do with Streaky? She is now almost 14 months old now and ‘primo’ size for pork. Yet we have still seen little action and she doesn’t appear to be showing any signs of being in-pig and I am still unsure whether she’s even coming into season. We did think we saw a difference in her the other week, and Smokey was sniffing around her. But I am not sure if we are seeing what we want to. We did initially set out to breed Berkshires, so if we have her for Christmas instead we have to look at replacing her. Again this leaves us with a decision to make- do we get another young piglet from a breeder (given there are only two within a reasonable distance and we can not use the one since our male came from there. And the other we’ve already had little luck with. And then we wait again, putting in more time and effort. Or do we search for an established sow; that we don’t know and have not raised. And if I’m honest, we bought a breeding pair so that we could rear them from young, build a relationship and become more attached… Can I be objective about it? If she’s not producing the goods, can I eat her? I also attempted to re-shuffle my birds. As the young Sussex cross chicks are now fully feathered and the brooder box was becoming crowded. The original four Indian Game chicks are also fully feathered, but still far too small to be placed in the outside run- as they could easily make it throught he chicken mesh. It’s amazing how much a of a size difference there is between these and our Sussex cross layers. So to move the Sussex crosses out, I needed to make room. Therefore I decided it was time the English Game cross hens made their way into the main chicken run. I had completely forgotten how athletic their father (our temporary resident pure Old English Game rooster) was! He initially escaped from the run and vanished for almost a week. Returning, where I eventually coaxed him into the general run. Where he stayed as he had food and girls. However he still roosted upon the 8 foot fence posts and was too fast to catch. These were traits we had neglected to consider when we incubated the eggs this arrangement produced. Putting more research into the bred, Old English Games are ideal for free ranging and require little food, as they are more than capable of sourcing their own. Unfortunately whilst I am happy for mine to ‘free range’ they are confined to an area of the garden during the day away from the dogs- for their own safety. I did attempt clipping their wings last night. 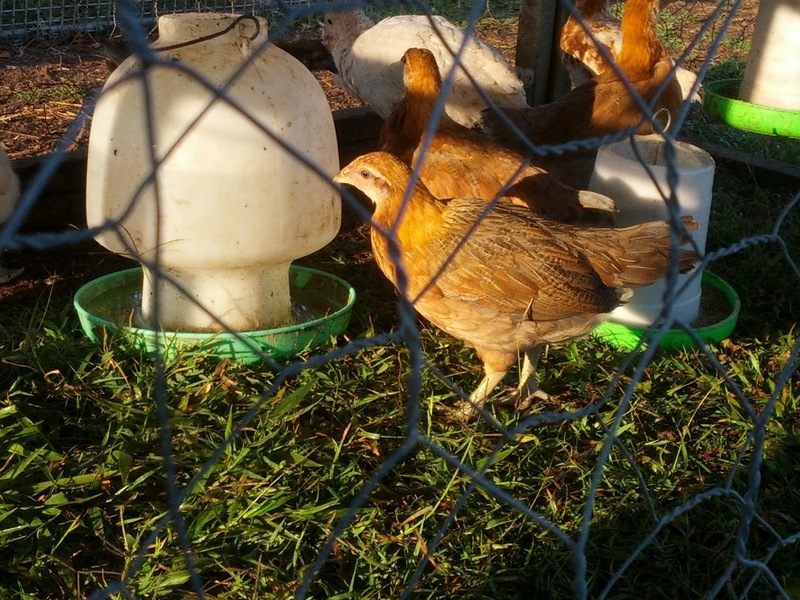 This was not successful as the hen immediately proceeded to scramble up the chicken mesh and roost upon the fence post. So most were returned to the enclosed run last night. The few that had made their way into the hen house we allowed to remain and I clipped their wings this morning. In an effort to limit their ability to make it into the dogs realm. Confinement for these birds is definitely not a long term solution and something I am not comfortable with. However as Matt pointed out, he would rather eat them himself instead of them becoming dog food… So I guess I have to give their future with us a little more thought, a pity given the colours that this cross over produced were varied and stunning! However a life of confinement is not acceptable to me and the chick run (whici is only meant to be a temporary solution until they are large enoughto stand ther ground amoungst the bigger birds and protect them from preditors- butcher birds, hawks, kookaburras etc) is becoming increasingly over crowded!